Two of the teens had previously benefited from justice reform. 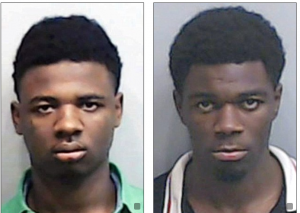 Jayden Myrick, 18, and Torrus Fleetwood, 19, and Montavious Lovejoy, 15, are being held over the death of Broder. Kevan Reeves, also 15, has been indicted and is expected to turn himself next week due to ‘procedural reasons,’ AJC reports. Broder, who managed Millie’s a California Baja-style restaurant in Washington DC, was waiting outside Atlanta’s Capital City Club with a group of friends after the wedding. They were waiting for their Uber when two men pulled up in a white Dodge Charger. Confusing the Charger for their ride, they approached the car, which is when one of the men got out from the passenger side, pulled out a handgun and ordered them to hand over their belongings, police say. Broder and his friends gave up their cell phones, wallets and other valuables, and the suspect returned to his car, according to police. That was when the 34-year-old father followed the suspect and tried to reason with him to give him his license. Both Myrick and Fleetwood also had recent criminal records, but had been released from jail after being granted leniency.